January 1st 2010 is the date BMW S1000RRs will start rolling out of UK dealers. I’m not sure how that will work in Scotland as Hogmanay normally lasts at least a week so no one will be sober enough to get a key in a showroom door far less ride a 190bhp superbike. If you do happen to be picking one up I hope you’ve ordered the sport model with DTC, ABS and GSA as you are in for a New Year treat. I didn’t truly believe we would see a traction control system this refined on a road bike so soon but I’m not complaining. You really can have this bike completely on its side and pull that throttle round to the stop without feeling the slightest squirm. When the front wants to paw the air more electronics kick in to bring it down and you even have a wee light blinking to let you know technology is keeping you safe. Unfortunately this now makes the Ducati DTC feel truly agricultural but I’m sure they’ll fight back. The quickshift gear change system is the other first for a superbike and unlike many racebikes this works well at any rpm and in any gear. There’s the ongoing debate whether we should have electronic trickery in racing but when stuff like this appears on our road bikes I say keep it coming cause it’s bloody brilliant! I caught up with an old Grand Prix buddy recently, Nobby Ueda. 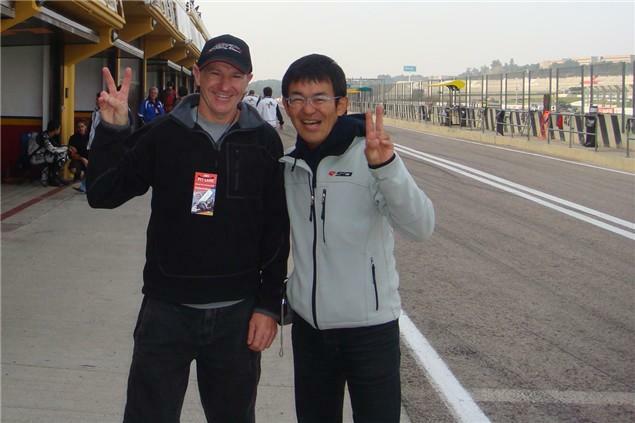 You may remember him as the smiling Japanese 125GP rider with the milk bottle glasses. In between some of the biggest highsides I ever witnessed he managed 39 podiums including 13 GP wins. During his twelve years in GPs he lived mostly in Italy totally embracing a laid back Mediterranean lifestyle and becoming fluent in Italian in the process. Although he has seven riders showing promise he says the youth of Japan have very little interest in racing today compared to how obsessed they were in the ’80s and ’90s. Back then, circuits would receive up to 400 entries for national 125 races and now they’re lucky to see forty. He reckons youngsters who would once be keen to get into racing now much prefer computer and video games. Kids tell him they can instantly have the excitement of motorsport for a few thousand yen without having to leave their front rooms. Sad as it is I believe they’re probably enjoying the same level of excitement without any of the hassle and of course no risk of gravel rash. A tough assignment indeed but I wish Nobby san much luck in his quest.